Argyle Street is an important and busy Glasgow thoroughfare. 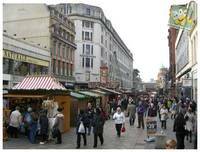 Together with Sauchiehall Street and Buchanan Street, it forms the main shopping district in Glasgow. It is the longest street in the centre of the city, and is 4 kilometres in length. Argyle Street starts in the southeast of Glasgow City Centre at the Trongate. It is partially pedestrianized, as far as Queen Street. Shopping in the area includes the St Enoch Centre and the Argyll Arcade. Argyll Arcade is a centre specialising in jewellery and it houses more than 30 jewellers and diamond merchants under its bright and sunny atrium. The St Enoch Centre is open 7 days a week until 6pm and has a range of top high street brand names such as Dorothy Perkins, Boots and Bhs. There is also a modern food court with an array of food on offer to suit every age and taste. There are also lots of activities for children and face painting every Saturday afternoon. Argyle Street connects with Sauchiehall Street at the site of the Kelvingrove Art Gallery, housing one of the best quality civic art collections in Europe. The Kelvingrove Gallery is on the banks of the river Kelvin and next to Kelvingrove Park. It is free of charge for visitors to enter the museum and there is fun for all the family within, due to the wide range of the collections, from natural history to spitfires. If you are looking for convenient hotels near Argyle Street, Glasgow and in the heart of Glasgow's shopping district, The Sandyford Hotel on Sauchiehall Street may be just what you need. We are located between the City Centre and the West End of Glasgow and offer 55 well-appointed rooms with en suite bathrooms and tea and coffee-making facilities. You will be pleasantly surprised at how affordable our B&B prices are and our helpful staff will help you get the most out of your visit to Scotland's largest city. Call The Sandyford Hotel today to enquire about our cheap bed and breakfast offers and to book a room in the centre of Glasgow, conveniently located near Argyle Street. You can also contact the hotel through the online booking form on this website. For a superb shopping trip in Glasgow, stay at The Sandyford Hotel.